“It’s an emergency!” How many times have I heard one of my kids yell during any given week? Sometimes it really is an emergency, but just as often, they only want me to see a new toy advertised on TV or listen to a newly discovered knock-knock joke. In real life, emergencies and emergency planning are no joke, but too often we get caught up in the day to day busyness of our lives and fail to take proactive steps to prepare for life’s unpleasant surprises. If the idea of being prepared for emergencies, is overwhelming, let me suggest a simple baby step. Plan and prepare for a two-week emergency. By far, this is the most likely event you and your family will encounter whether it’s a severe weather event, a natural disaster, or a flu bug that hits everyone in the family, mom included. One of the easiest things you’ll ever stock up on is water. It’s as simple as refilling clean 2-liter soda bottles with tap water, labeling them with the date filled, and storing them in a closet or under a bed. Fourteen of these bottles is a week’s supply of water for one person. Buy a few cases of bottled water if you like, and you’re set. This step is a little more tricky because I want you to assume that your power will be out for some or all of this two week-long emergency. Think about meals your family would eat that require little preparation. Without electricity, you’ll be eating things like cereal with dehydrated milk and pudding cups. Stock up on some energy bars, applesauce, jerky and dehydrated fruits and veggies. Peanut butter and honey on crackers, Dinty Moore stew, pudding and applesauce cups, and trail mix will keep tummies filled until life returns to normal. With a black Sharpie, circle the expiration dates on these products since many aren’t intended for long-term storage. Whew! It’s amazing how many more options there are when you can heat up some water and cook a simple meal. A solar oven, rocket stove, grill with plenty of fuel or a campstove (with fuel) will make life easier and meals more satisfying. Having a method of heating water for purification might be a lifesaver. Just be very, very certain that whatever method you choose can be used safely in your home or yard. At some point during this emergency, someone is going to get a splitting headache, and it will probably be you! Make sure you tuck away an extra bottle of painkiller and a children’s version as well. This emergency could happen just when you use up your last drop of shampoo, so be sure you have extras of things like shampoo, baby wipes, toilet paper, dish and laundry soap, tampons, etc. Again, look for bargains, and buy what you can, when you can. In case you find yourself in a water shortage, stock up on paper plates, cups, and disposable forks and spoons. Emergencies will always catch us by surprise. That’s their nature. However, whether we are prepared or not is entirely up to us. Take action today to put these four steps into place, and you’ll feel ready for Baby Step #2. I love this post. Thank you for breaking things down like this and making prepping seem easier. We live in a hurricane prone area, so for me, prepping has always just been a way of life. Still, it can seem overwhelming when you think about it. The way you've broken it down here really makes it much less overwhelming. Excellent idea Lisa. Many people become overwhelmed at the thought of storing supplies for 3 months, 6 months, or ONE YEAR! Your Baby Steps is much more manageable. Just a reminder: thegrocerygame.com is an excellent site for stockpiling on a tight budget!!!! I have (well over) a year's supply of: toiletries, OTC meds, vitamins, paper towels, and laundry detergent. My food stockpile at least 3 months. Most of the items were 60% off or MORE! Website is offline No cached version of this page is available. Yeah, sometimes that happens, unfortunately, even with good websites like The Grocery Game. I like that there has been a lot of mainstream media that has enticed newbie preppers. This is a great article to break it down for people new to the habit. I was quietly thinking of you while my family was stuck on the road with a car that had suddenly died ,(of course at night). We were able to push our car to a well lit area (Hooter's parking lot). I had my list of phone numbers and began making phone calls, the children had their little bags (flashlights, light sticks, etc) We had all our needs met so as not to compromise my children's innocence by stepping into Hooters for water, restrooms or food! So taking one day to create an emergency bug-out bag that I keep in my car has already proven invaluable. I would also add get used to carrying water on you. Even if it is just a bottle of water, or like I started carrying a military quart bottle on me. Maybe also put some bottles in the car too. It is nice to have that extra drink when needed. Baby steps are also taken every day…or every few days in my case. After reading your post, I took a look at my backup pantry and supplies. I hadn't added to it much lately. My Grab-n-Go binder began with a flurry of activity but has been collecting dust for two months. I also just saw a Rachel Maddow show about a new book out that predicts a crash of our financial system…the online-ATM-pay-as-you-go financial system. I decided to get back in gear. I went shopping and spent $100 on canned items and non-edibles; I added a few more needed copies and printouts to my binder; I took a lock box and started a cash stash with $100, and added a note pad, pen and calculator. Taking those small baby steps really made my day!! I think we all need a kick in the pants every once in a while! The flurry of life goes on, and we can't help but get distracted. Water storage – how long? This question came up 9 years ago at the hospital where I work. 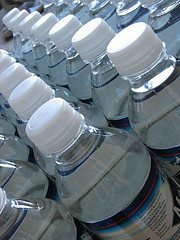 A year had passed since the Y2K bug didn't materialize but we had prepared by hording tons of water and now one of the senior administrators asked the simple question…"how long does bottled water last?" None of us knew. I ask this in response to this blog post because I like the idea about the 2-liter bottles and marking the dates…but wonder when the water should be disposed and refilled? i'll pour it out once a year. i have a well that likes to act up every so often and it is so cool to have jugs of water nearby to prime it. i use milk jugs filled with tap water and dated. this way i don't have to bother with bleach. it's also really cool to be able to flush the toilet without electricity if i have to. I have added a couple drops of bleach to stored H2o and labled it 'washing water'. Stale water can be shaken to freshen it up. Stale water is better than none.